How can Contract Killers help? 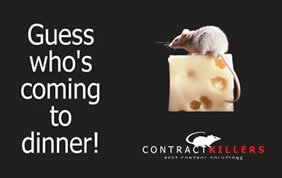 Serving Hampshire and West Sussex, Contract Killers Ltd is a Portsmouth-based pest control company that specialises in the detection, identification and prevention of pests, including: rats, wasps, fleas, ants, flies, mice, cockroach, crawling insects, moles, rabbits, feral pigeons, wild birds and larger species. With over fifteen years of experience, Contract Killers Ltd can provide one-off treatments, such as bird proofing and the removal of bird fouling to pest control and prevention contracts. 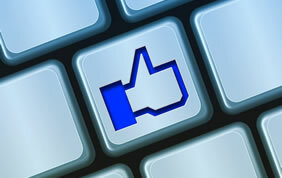 We are proud to be used and approved by Portsmouth City Council. We cater for both commercial and domestic markets and offer a personal, professional service. Unmarked vehicles are available! Contract customers receive a full written report following every visit. These contain details of any actions taken and advice relating to pest control, housekeeping and storage. 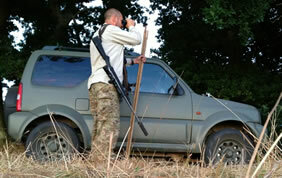 The reports are retained in the pest control folder we supply. Environmental Health Officers, Local Authority Food Safety Officers or any other authority can examine the reports and be assured that effective pest control measures are being taken and that you are demonstrating 'due diligence'. 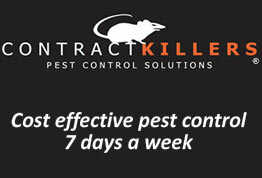 Contract Killers Ltd only use the most up-to-date insecticides, rodenticides, traps and control devices that are available to the professional pest control industry. One of the many professional services that we offer is our Insect identification service. Most specimens can be positively identified within 48 hours of receiving or collecting a suitable sample. If required a complete written report, detailing the insects' natural habitat, life-cycle etc can be supplied. From time to time bugs appear Inside the Museum that could contaminate or damage the collection. Mr Lee Marshfield of Contract Killers Ltd has given us first class advice and support on all of our problems, sometimes sensitive problems, and has dealt with them in a positive, professional and cost efficient way. © 1999-2019 Contract Killers Ltd. Registered in England and Wales. Company No. 5060651. All rights reserved.